Muslims are a relatively small minority in Europe, making up roughly 5% of the population. However, in some countries, such as France and Sweden, the Muslim share of the population is higher. And, in the coming decades, the Muslim share of the continent’s population is expected to grow – and could more than double, according to Pew Research Center projections. These demographic shifts have already led to political and social upheavals in many European countries, especially in the wake of the recent arrival of millions of asylum seekers, many of whom are Muslims. In recent national elections in France and Germany, for instance, immigration — and particularly Muslim immigration — were top issues. 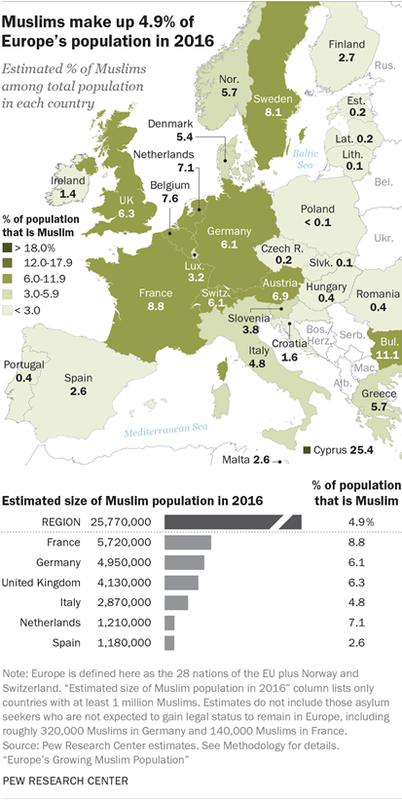 1France and Germany have the largest Muslim populations in Europe (defined as the 28 current European Union member countries plus Norway and Switzerland). As of mid-2016, there were 5.7 million Muslims in France (8.8% of the country’s population) and 5 million Muslims in Germany (6.1%). The EU country in which Muslims make up the largest share of the population is Cyprus: The island nation’s 300,000 Muslims make up about one-quarter (25.4%) of its population, and are mostly Turkish Cypriots with deep roots in Cyprus (and not recent migrants). The Muslim share of Europe’s total population has been increasing steadily and will continue to grow in the coming decades. From mid-2010 to mid-2016 alone, the share of Muslims in Europe rose more than 1 percentage point, from 3.8% to 4.9% (from 19.5 million to 25.8 million). By 2050, the share of the continent’s population that is Muslim could more than double, rising to 11.2% or more, depending on how much migration is allowed into Europe. Even in the unlikely event that future migration is permanently halted, the Muslim population still would rise to an estimated 7.4%, due to the relative youth and high fertility rates of Europe’s current Muslim residents. 3Muslims are much younger and have more children than other Europeans. In 2016, the median age of Muslims throughout Europe was 30.4, 13 years younger than the median for other Europeans (43.8). Looking at it another way, 50% of all European Muslims are under the age of 30, compared with 32% of non-Muslims in Europe. In addition, the average Muslim woman in Europe is expected to have 2.6 children, a full child more than the average non-Muslim woman (1.6 children). 4 Between mid-2010 and mid-2016, migration was the biggest factor driving the growth of Muslim populations in Europe. An estimated 2.5 million Muslims came to Europe for reasons other than seeking asylum, such as for employment or to go to school. About 1.3 million more Muslims received (or are expected to receive) refugee status, allowing them to remain in Europe. An estimated 250,000 Muslims left the region during this period. 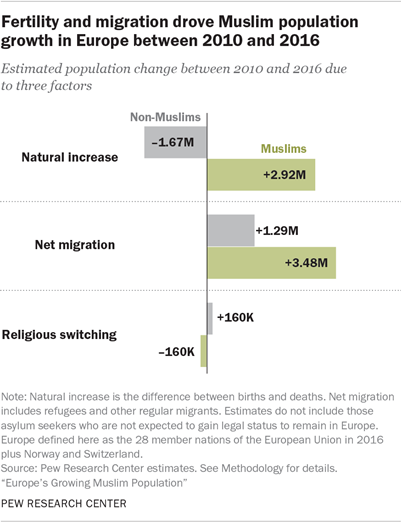 Natural growth was the secondary driver: Among European Muslims, there were 2.9 million more births than deaths during this period. Religious switching is estimated to be a small factor in Muslim population change, with roughly 160,000 more people switching away from Islam than converting into the faith during this period. 5Views of Muslims vary widely across European countries. A 2016 Pew Research Center survey conducted in 10 nations found that negative views about Muslims prevailed in eastern and southern Europe. However, the majority of respondents in the UK, Germany, France, Sweden and the Netherlands gave Muslims a favorable rating. Views about Muslims are tied to ideology. While 47% of Germans on the political right give Muslims an unfavorable rating, just 17% on the left do so. The gap between left and right is also roughly 30 percentage points in Italy and Greece. Note: This is an update of a post originally published on Jan. 15, 2015.